We have a couple of times wandered down through the countryside from Bristol to Bath, and so we found the Herschel Museum, tucked down a little street. I had heard of Sir William Herschel vaguely, but was happier to find out about the life of his sister, Caroline. And I bought this book. Put together by her niece Mary Herschel in 1878, it is lovely but I definitely feel it is time for a new appraisal. Caroline’s own memoirs which she wrote are here cut up, put into context, probably somewhat expunged — though it is had to tell through the veil of both women’s intense sense of propriety. 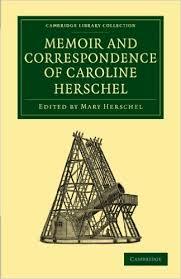 The letters are brilliant though, and give a wonderful sense of Caroline as well as how much she was loved and admired by others, particularly her nephew Sir John Herschel, who followed in the footsteps of her brother William. Caroline lived for an extraordinarily long time, 1750-1848. She was in a position to do astronomical observations for only a portion of this time, but she found seven comets, did loads of work, was first woman to receive a medal from the Royal Astronomical Society in 1828, and actually made an honorary member of the Society with Mary Somerville in 1835. This was not in fact her fate, but always there is the sense that she is still, to some extent, living within its boundaries. She left Hanover in 1772, William persuading her mother to let her go and become his assistant in Bath. In 1782 he was appointed the King’s Astronomer (for a large cut in pay, and a lot of showing royals the stars), moved to Slough. She went with him. She tried to educate herself. But is always forced to remain conscious of her own lack of education, and her complete dependence upon others. It is a terrible thing, like a straightjacket which she must live within. This despite her wonderful singing voice and musical abilities, as well as her intelligence and determination. I think that last sentence explained an immense amount of her letters and the choices made in her memoir to me. That last sentence embodies everything that women have been fighting for centuries. When her brother marries and promptly turfs her out of their home, it only highlights the injustice of a society unable to value women except as mothers or wives…she overcomes it all. So much of her memories and her letters has to do with being ill, long bouts of sickness, I am sure exacerbated by working through the nights in cold and damp. She moved back to Hanover after her brother’s death, only to be deeply disillusioned by the lack of intellectual society and the terrible mistreatment by her own family. She was no longer able to search for stars, only work on her indexes. Yet she was stuck, and forced to make the best of it. I found my aunt wonderfully well and very nicely and comfortably lodged, and we have since been on the full trot. 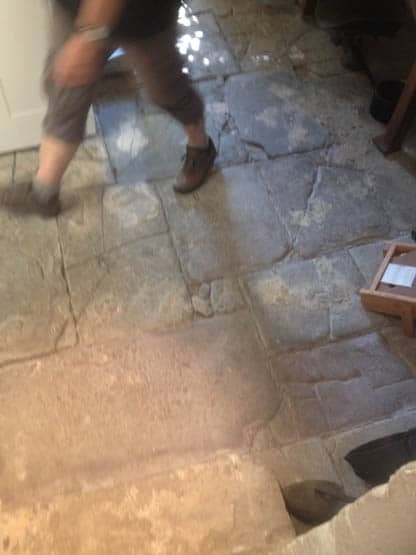 She runs about the town with me and skips up her two flights of stairs as light and fresh at least as some folks I could name who are not a fourth part of her age …. In the morning till eleven or twelve she is dull and weary, but as the day advances she gains life, and is quite “fresh and funny” at ten or eleven, p.m., and sings old rhymes, nay, even dances! To the great delight of all who see her …. I wish you would let me know if any of the works of Schelling are known in England? Of him it is said that his philosophy is entirely new, and beyond all what goes before, and so profound, that nobody here can understand him, &c.
Philosophy hasn’t much changed I don’t think. All in all this is a fascinating little book, but I would love to see Caroline Herschel become better known and better studied.